We can drum on and on about having purpose. 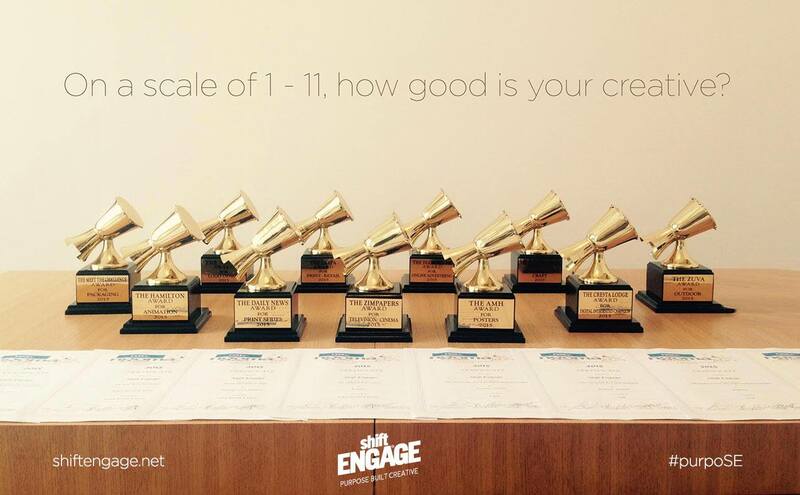 But honestly, that’s the only secret to sweeping awards at the Ngoma Awards.Anyway, it’s the reason why something is created, made or exists, which is why everything we do at Shift Engage is built around PURPOSE. Every advertising communication for every client is crafted around a purpose. It is designed to meet defined objectives. It is shaped to achieve results. We can drum on and on about having purpose. But honestly, that’s the only secret to sweeping awards at the Ngoma Awards. Anyway, it’s the reason why something is created, made or exists, which is why everything we do at Shift Engage is built around PURPOSE. Every advertising communication for every client is crafted around a purpose. It is designed to meet defined objectives. It is shaped to achieve results. It was the 3rd year we participated and – put on your leprechaun voice – the year we won the most gold. But 11 wins and 9 runners up for the Zimbabwe Ngoma Advertising Awards for 2015 was not a result. What it is was the clear recognition of work that took aim at and hit its target – for effective creativity that accomplished its goals and reached the purpose it was set out to do. The real results we achieved during that business year went unremarked publicly. Like how one client tripled his sale forecast for a particular product. Where a social conversation went viral to achieve national awareness. And a brand grew from a market player into the clear market leader. Runner Up: Cartrack – Use It. Don’t Lose it! There’s really no magic secret. We think ‘BIG IDEA’, also define the communications objectives right from the outset, where strong client briefing is vital, and by ensuring the work meets these objectives, we produce strong creative work that gets results for the clients. It’s work that gets results that should go on to win awards, and not the other way round. So, while we are proud of the awards and accolades we receive on behalf of our clients, we never lose sight of the fact that awards are secondary to the success of our clients’ business, and assisting in creating that success, is our primary purpose.